Charlotte’s mother is always home, and yet she isn’t. She spends most of her time sleeping along with strong medicines to stay asleep. When her mother doesn’t sleep Charlotte gets new fathers. One of them shows her that something else and better is possible. This last way too short, and then a new father comes along. As a 12-year-old Charlotte experiences something she can’t understand. In time she discovers how useful her mother’s pills can be, and she’s happy to discover that there’s a way to turn of her emotions. Charlotte is soon lost in a distance between herself and others. Is it possible for her to get out of a childhood with destructive patterns? Like I said, Kinderwhore shook me. I noticed that I distanced myself sometimes while reading, mostly because I found it so hard to believe that this was possible to happen to anyone. Yet, I do know that it is possible, it’s just that I find it so hard to accept it. Children don’t deserve to be ruined by their parent’s problems. What I found most terrible were how Charlotte’s mother couldn’t be a mother. I have too little life experience, and I’m certainly not a mother yet, to say too much about this, because my life has been extremely simple when you listen to or read the stories of others. There are so many sad aspects in this story that you start to wonder if it will ever end, but mental issues tend to spiral and for those struggling it may possibly look like they never will end. This book gave me some insight into how it might be to live with a mental issue and to me that has been important. I will never fully understand, but at least I can learn a little bit about it. The most powerful tool Fonn has used is a simple language and short chapters. Her chapters vary in length, but no matter the length they convey their message loud and clear. When I finished reading I was left with the feeling of hopelessness. I think it is horrible that young boys and girls are left feeling the way they do because of something they’re not in control of. I was mad and sad too because I did not want Charlotte to feel like she did because she had such a promising life ahead of her. 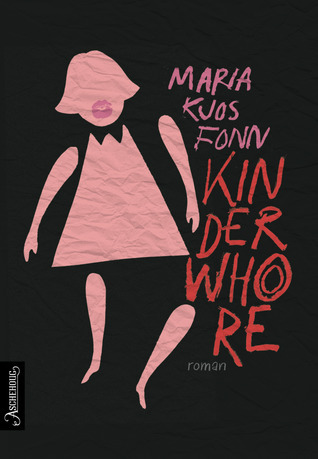 Kinderwhore was sent to me by Aschehoug Publishing House. I find it hard to write about this book because there are so many aspects of this book that is so horrible and so dark. I saw online that someone called it demanding and insightful, and I agree wholeheartedly. This is not meant in a bad way. I’m very glad I got the chance to read this book because it gave me a lot. It will take some time to digest it because this is not the kind of story you forget. In many ways, it has given me a glimpse of what I might meet within the career path I’ve chosen for my life, and that is important. Kinderwhore made me feel a lot, and it made me think. It made me think about stuff that I normally might take for granted or not pay much attention to at all, and this is my favourite part of the book. I recommend this book, but not to everyone. It is extremely powerful and demanding, but it gives the reader a lot too. Neste innlegg 10 books to give your bookworm for Christmas!